While the circumstances are different in every case, the end of life is always a difficult time for seniors and their families. However, even if the end of life process is never easy, the process can be easier with the right support and assistance. At Visiting Angels®, we seek to provide this support and assistance through our End of Life Care program. This program provides non-medical care to seniors approaching the end of life, while also providing families with the support and resources they need to navigate the end of life process. Our focus on both seniors and families is a crucial part of this program. When searching for end of life care for a spouse, parent, or grandparent, it is easy to focus on the care that is directly provided to your loved one. Yet, in many cases, a care agency’s most valuable work is performed indirectly. After all, your loved one would rather spend their last days enjoying quality moments with those they love. By supporting family members throughout the end of life process, non-medical end of life care can make more of these moments possible. When a spouse or family member is nearing the end of life, you may find yourself feeling lost and overwhelmed. Few of us have the training or experience needed to properly care for an ailing loved one, and that’s to say nothing of the emotions you’ll need to grapple with during this period. Caregivers who provide non-medical end of life care can often draw on their training and/or experience to improve quality of life for the care recipient in these areas. However, a caregiver doesn’t need to be in the same room as a care recipient to improve that person’s quality of life and well-being. Many end of life caregivers run errands, do laundry, prepare meals, and perform other tasks to ensure that the care recipient has everything they need for their comfort and well-being. The impact of this behind-the-scenes work can be even more significant for the care recipient’s family members. When caring for a loved one at the end of his or her life, it is common for family members to find themselves feeling overwhelmed. The long days and constant care work render them physically drained, while the circumstances of the situation leave them feeling emotionally exhausted. Having a professional caregiver on hand can make a world of difference in these situations. A caregiver will help you shoulder the load by handling difficult care duties, performing day-to-day errands and chores, and providing you with respite whenever and wherever it is needed. This support allows you to tend to your own well-being during the end of life period. This allows you to be more present for your loved one and provides your loved one with higher quality care. It also gives you more time to spend with your spouse, parent, or grandparent. Instead of washing clothes, making medicine, or running errands to the pharmacy, you can spend that time in the presence of your loved one, enriching their final days. While the decision to hire end of life care services is a deeply personal decision, the assistance provided by a professional caregiver can make a deeply difficult time easier on you and your loved one. 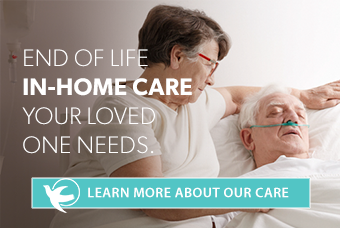 Our end of life caregivers work closely with hospice providers to ensure all your needs are met. To find out if end of life care is the right choice for your loved one, we encourage you to contact your local Visiting Angels for a free consultation with one of our care directors. You can learn more about our End of Life Care program online, or you can contact your local Visiting Angels to schedule a consultation. Call 800-365-4189 to find a Visiting Angels office near you.